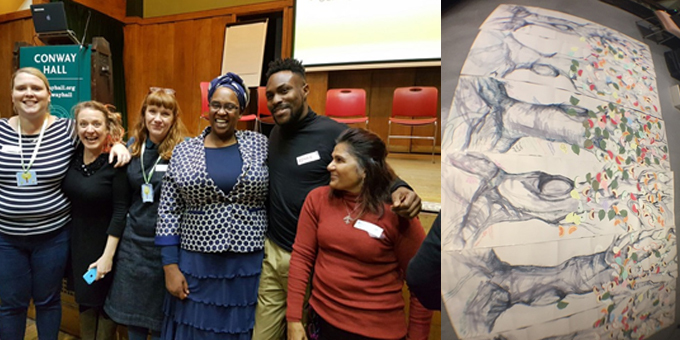 This conference was a co-produced event by staff and service users from the NHS, and the Friends of KCC organisation, writes Isabelle Ekdawi, Consultant Systemic Psychotherapist. The day was opened by two service users, Maggie and Ursula, and their warmth and enthusiasm set the tone for the event. As well as a key note presentation from Ncazelo Ncube (pioneer from the approach, who had come over from South Africa) we had presentations from service users and clinicians who had used the Tree of Life, or adaptations of it, in a wide range of contexts. These included: a presentation on the ‘Beads of Life’, for young people with cancer on an inpatient unit; ‘Faith in Recovery’ – a presentation on incorporating beliefs from Islam into Tree of Life work in East London; use of the Tree of Life in older people’s and learning disability services; the professional Tree of Life; as well as our SLaM project – using Tree of Life on acute inpatient wards. People with experience of services made a huge contribution to the day, with almost all presentations being co-facilitated by service users, and a number of service users being in the audience. The day was energising, moving and enlivening – and ended with a group of service users from Positive East presenting Ncazelo with a tribute that they had made for her, and then with music and dancing!